Have you ever wondered what happens when after we close our eyes and drift off to sleep? While our bodies may appear to be inactive during this period, there’s a lot going on behind the scenes. 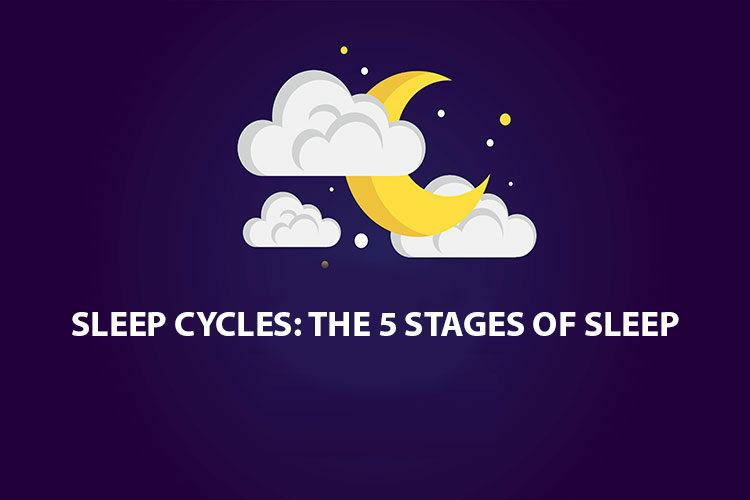 Sleep is not one homogeneous entity: It’s actually comprised of 5 distinct stages that repeat cyclically throughout the night. Understanding how sleep stages work can help you work towards getting the most out of your sleep; and can make planning the most refreshing nap a breeze. Your brain cycles through 5 different sleep stages throughout the night, with a full cycle taking 90-120 minutes to complete. The duration and frequency of the different stages also changes over time. The REM component of each sleep cycle increases as the night goes on, so that REM effectively dominates the second half of the evening. Meanwhile, slow-wave (Stages 3 and 4) sleep decreases as morning approaches. Each stage is unique and plays a specific role in the sleep process. This is the transition period being waking and sleep. During this brief stage you actually drift in-and-out of sleep, and can be easily aroused by external stimuli. You may maintain awareness of your external surroundings, yet feel a sense of distance from them. The brain starts to shift from the unsynchronized waves associated with waking, to slower, more predictable Alpha waves and finally into Theta waves. The body enters a state of relaxation: Breathing becomes more regular, and your heart rate begins to slow down. However, the muscles are still quite active when compared to other sleep stages. It’s common to experience the phenomenon known as hypnic jerk -- sudden muscle spasms which are often perceived as falling. This is the first stage of unequivocal sleep. Your conscious awareness begins to wane even further, and the muscles throughout the body relax. Theta waves are more predominant, but are now interspersed with two unique wave phenomena: Sleep Spindles (a sudden increase in wave frequency) and K Complexes (a sudden increase in wave amplitude). These help enforce sleep by suppressing your response to the outside world. 45-50% of total sleep time. Sudden bursts of brain activity. Together stages 3 and 4 are known as Delta, deep or slow-wave sleep. It’s extremely difficult to wake someone from deep sleep, and if you do wake from these stages you are likely to experience sleep inertia: characterized by brain fog and disorientation. The stages get their name from the very slow Delta waves which predominate brain activity. You may still experience some sleep spindles, but much fewer and far between than in Stage 2 sleep. Stage 4 is distinguished from Stage 3 by the amount of delta waves. Once these reach over 50% of brain activity you are considered to be in Stage 4 sleep. Dreaming is more common during Stage 4 than other non-REM stages; but this does not compare to REM sleep. Delta Sleep is also when people experience parasomnias, such as sleep-walking, sleep-talking, and night-terrors. REM Sleep gets it’s name from it’s more iconic feature: Rapid, jerky eye movements. However, it’s also known as paradoxical sleep due to the presence of brain waves similar to that of a waking state. Your breathing becomes rapida and irregular, while blood pressure and heart rate increase to that of waking levels. Your core temperature is also not well regulated during this stage, and signs of sexual arousal are typical. We experience the majority of our dreams during REM, and due to the unique brain activity these are also our most vivid and memorable dreams. The voluntary muscles are effectively paralysed, which is believed to be a mechanism to prevent you from acting out your dreams. Each of the five stages is equally necessary to provide you the most restorative, restful and replenishing sleep. Awakening frequently at night, being startled awakened by an alarm or simply not fitting in enough hours of sleep impacts the number and quality of your sleep cycles. Your ability to regulate and pass seamlessly from one stage of sleep to another depends heavily on your circadian rhythms. Practicing sleep hygiene can help you get your sleep cycles on track. Also make sure to sleep on a mattress that doesn't keep you up at night. There are various organic options out there as well as options for all sleeping and body types.